Based on the The Blender Girl Smoothies app, this popular smoothies book (published by Ten Speed Press) has 100 smoothie recipes for weight loss, energy, immunity, detox, protein, inflammation, alkalinity, and more. There is also a smoothie glossary and smoothie-making chart to make your own blends. The book is available at bookstores and online outlets. 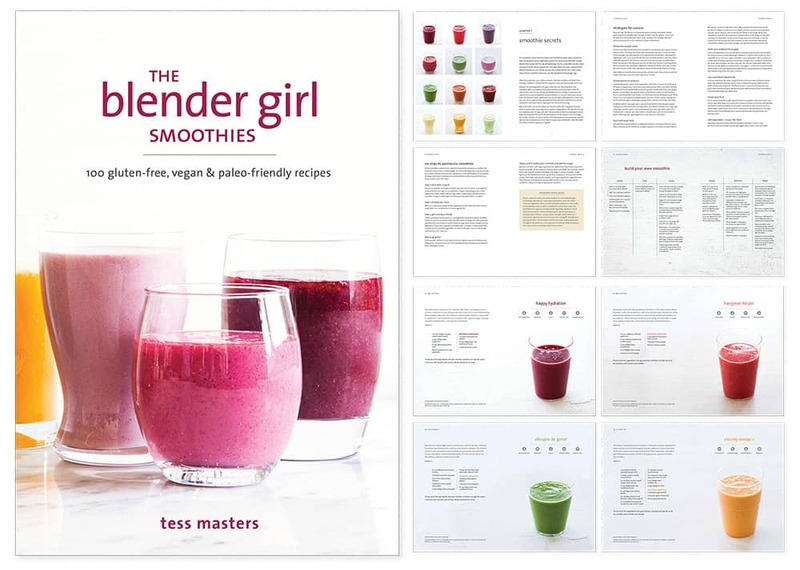 The Blender Girl Smoothies book (published by Ten Speed Press) is based on The Blender Girl Smoothies app (with Penguin Random House) that was one of three finalists for best app of the year in 2014. 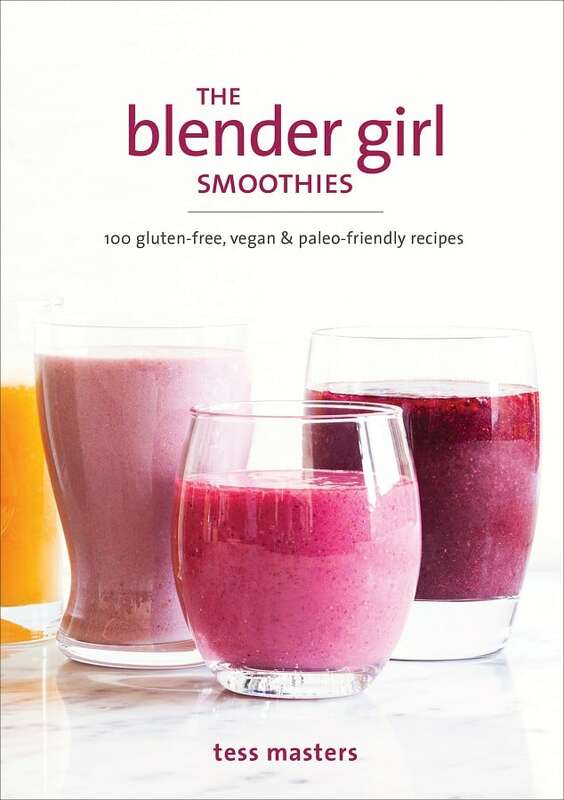 This book contains 100 of the best smoothie recipes from The Blender Girl collection. 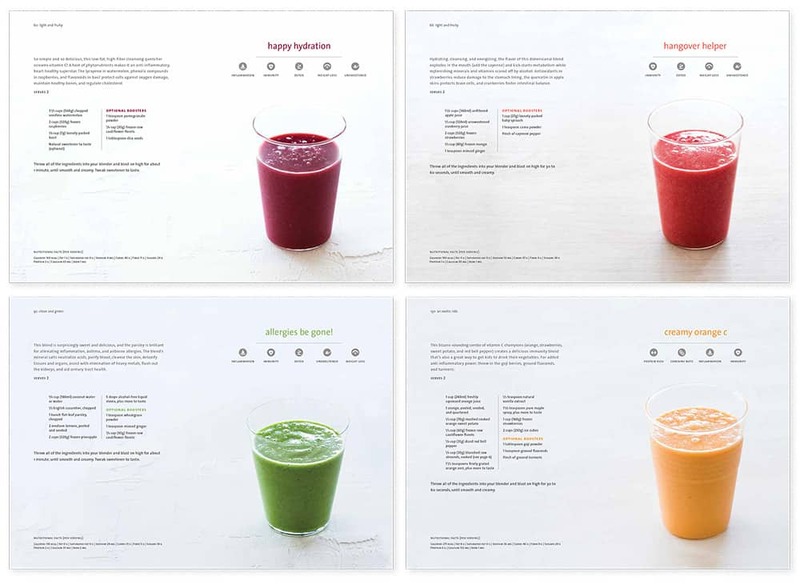 There is a stunning photo and double-page spread for each smoothie with recipe summaries listing the health benefits, and special icons to flag specific needs - weight loss, immunity, detox, energy, inflammation, protein, alkalinity, unsweetened, and nuts (for allergies). Ingredients lists include both imperial and metric measurements, and there is also a full nutritional analysis for each smoothie providing calories, fat, sodium, carbs, fiber, sugar, protein, calcium, and iron levels per serving. All smoothies make two 16-ounce glasses and are designed to serve 2 people. You can search for smoothies fitting your dietary preference via the index of the book. There are also smoothies that are sugar-free tagged with the unsweetened icon. So, whether you want to detox, lose a few pounds, get energized, or guard against seasonal colds, there is a smoothie recipe for your every need! Every smoothie has three optional boosters (like chia seeds, ginger, coconut oil, wheatgrass, superfood powders) that allow you to ramp up flavor, nutritional value, or both. Use one, two, or all three options together in your smoothie according to your taste or sense of adventure. The benefit or flavor effect of each smoothie booster is called out in the head notes for each recipe. In addition to the smoothie recipes, there are a ton of smoothie making information so you can create your own amazing smoothie recipes. combining ingredients to elevate flavors and textures to help you take your smoothies to the next level. Use the 6 Steps To Spectacular Smoothies chart to build your own incredible smoothies. Thousands of people have used this chart to build smoothies with rave reviews. It really works! Don’t miss The Smoothie Pantry! So, take your smoothies to the next level, and get your copy now.